Reel Gangsters Video Slot Review - Casino Answers! 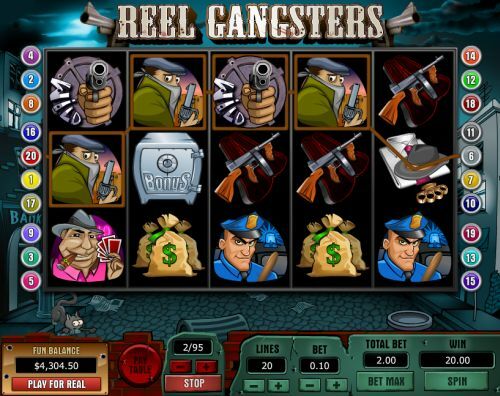 Reel Gangsters is a 5-reel, 20-line video slot developed by Top Game, featuring a wild symbol, free spins and a bonus game. You can play the Reel Gangsters video slot at Bovada. The Reel Gangsters casino game is a penny slot. Bets on the Reel Gangsters slot machine are $0.01, $0.05, $0.10, $0.25, $0.50, $1, $3 and $5 per line. You can select up to 20 paylines per spin on the Reel Gangsters slot game. The maximum total bet per spin is $100, which gives the Reel Gangsters online slot a good betting range for most online slots player. To play the Reel Gangsters video slot, select your bet and hit the “Spin” button. Quickly select all 20 lines and spin the reels by hitting the “Bet Max” button. The top-paying symbol on Reel Gangsters is the Pistol symbol. 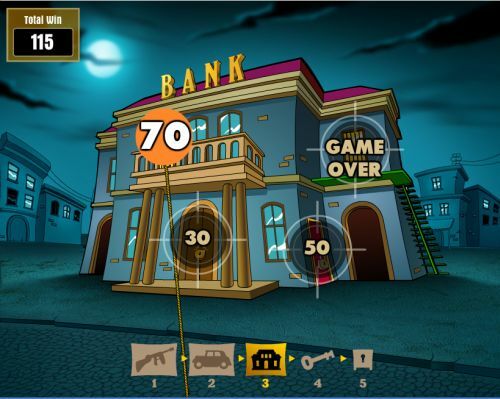 5 Pistols symbols in a row on a selected payline will pay out the 10,000 coin top jackpot. That’s not all a Pistol wild symbol can do, though. It will also substitute for all other symbols except for scatter and bonus symbols. The next highest paying symbol is the Mob Boss, which can pay out up to 1000 coins. But remember, kids… crime doesn’t pay. The scatter symbol is the Newspaper symbol. Hit 3, 4 or 5 Scattered Newspaper symbols on the Reel Gangsters video slot and win 5, 10 or 25 free spins respectively! If you hit three more Vault symbols during the free spins feature, you can re-trigger the free spins feature and win more free spins. You can win free cash with the free spins feature on Reel Gangsters at Bovada. Payouts are made according to the Paytable. All symbols pay from left to right. Scatters pay on any position. Only the highest win is paid on each selected payline. Scatter and Bonus wins are paid in addition to payline wins. All payline wins are multiplied by the bet per line. Reel Gangsters has a basic autoplay mode. You can select from 5 to 95 autoplay spins (in increments of 5) using the “+” and “-” buttons. To start the Reel Gangsters autoplay feature, select your number of automatic spins and press the “Start” button. At any time, you can stop the autoplay mode by hitting the “Stop” button. Reel Gangsters has some excellent presentation to go along with the bonus game and free spins special features and the high top payouts found on the video slot. Top Game has definitely stepped up its game with the Reel Gangsters video slot, which you can play at Top Game casinos like Bovada. Can players from the United States play the Reel Gangsters casino game for real money? Yes, you are welcome to play Reel Gangsters for real money even if you’re residing in the United States of America. USA players can play the Reel Gangsters video slot at Bovada. Can I play an instant play Reel Gangsters flash game for free? No, there is no instant play version of the Reel Gangsters fruit machine available at this time.